Farmers who developed a new way to enjoy coffee are savoring the sweet taste of success after creating a buzz among the judges of a countywide entrepreneurial competition on Hawai‘i Island. Big Island Coffee Roasters was named the 2018 winner of the HIplan Hawai‘i Island Business Plan Competition at the conclusion of the final round of the program held Saturday, Oct. 26, at the University of Hawai‘i at Hilo. Big Island Coffee Roasters, winners of the 2018 HIplan Competition Grand Prize of $25,000. : (L–R) Jason Ueki (executive director of HIplan), Kelleigh Stewart (Big Island Coffee Roasters), Brandon von Damitz (Big Island Coffee Roasters), Gordon Takaki (president of Hawai‘i Island Chamber of Commerce) and Jim Wyban (founder of HIplan). 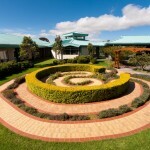 Courtesy photo. The husband-and-wife team of Kelleigh Stewart and Brandon von Damitz edged out seven finalists to take home top honors for their newly created Espresso Bites, an edible espresso bar. Each 1.5-ounce bar, which resembles the texture of a chocolate bar, is made entirely of coffee and contains the equivalent of three espresso shots. Pieces of the bar can be melted in a cup of hot water to drink as you would regular coffee, eaten as a snack bar, or chopped up and added to sweet and savory dishes. In development for two years, the bars feature locally grown Ka‘ū coffee and contain five all natural ingredients. 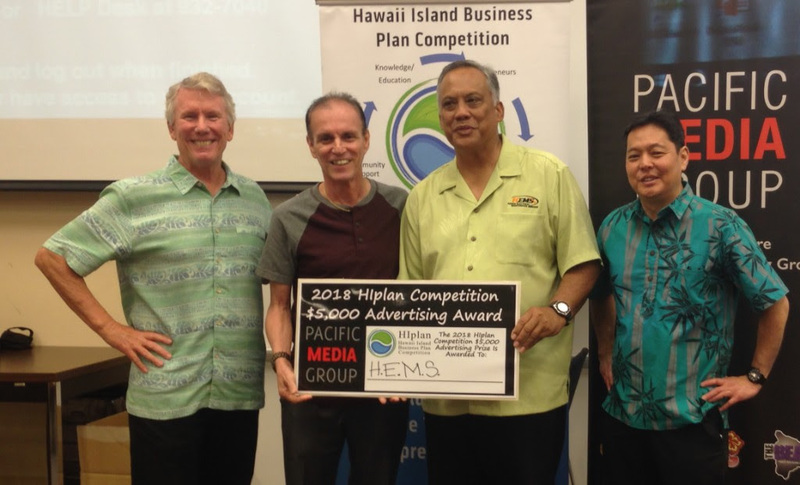 Hawai‘i Electrical Maintenance Services, owned by Benson Medina, won $5,000 worth of free advertising with Pacific Media Group, the official media sponsor of the competition. Hawai‘i Electrical Maintenance Services, winner of the $5,000 HIplan Pacific Media Group Advertising Award: (L–R) Jim Wyban, Rod Pacheco (PMG), Benson Medina (HEMS) and Jason Ueki. 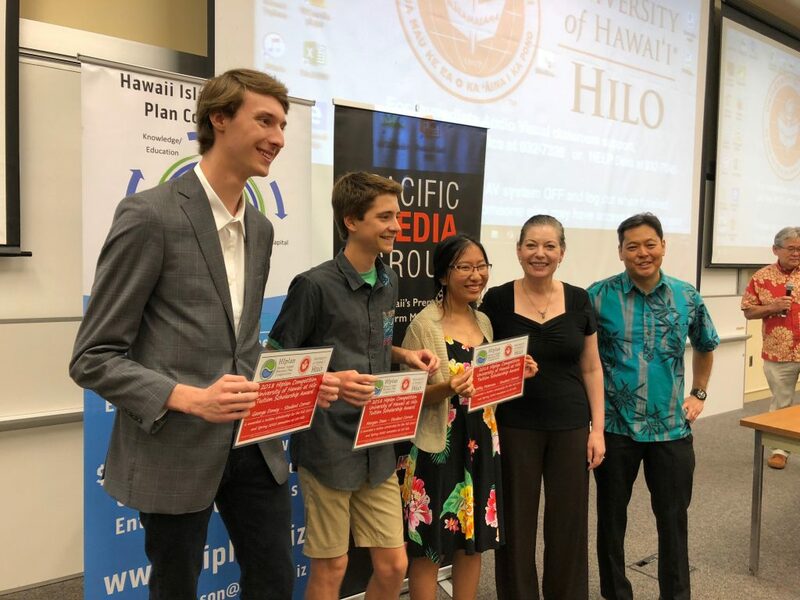 Two UH-Hilo students and their four high school teammates each won partial tuition scholarships for the Fall 2019 and Spring 2020 semesters at the university for their business plan called Student Corner, which is a project-based educational concept. Student Corner winners of the HIplan-UH-Hilo Tuition Scholarships: (L-R) George Donev, Morgan Dean, Abby Peterson w Em de Pillis (UHH) and Jason Ueki. “This is the highest quality of competitors we’ve had in the finals in the three years of competition,” said Jason Ueki, executive director of HIplan. The judges were also impressed by the quality of local businesses that had advanced to the final round. Other business finalists included Lawaia Fresh Fish Company, Mauna Kea Cacao, Pau Hana Pet Resort, SRFly, Uncle Tilo’s Water Catchment and Upcycle Hawai‘i. 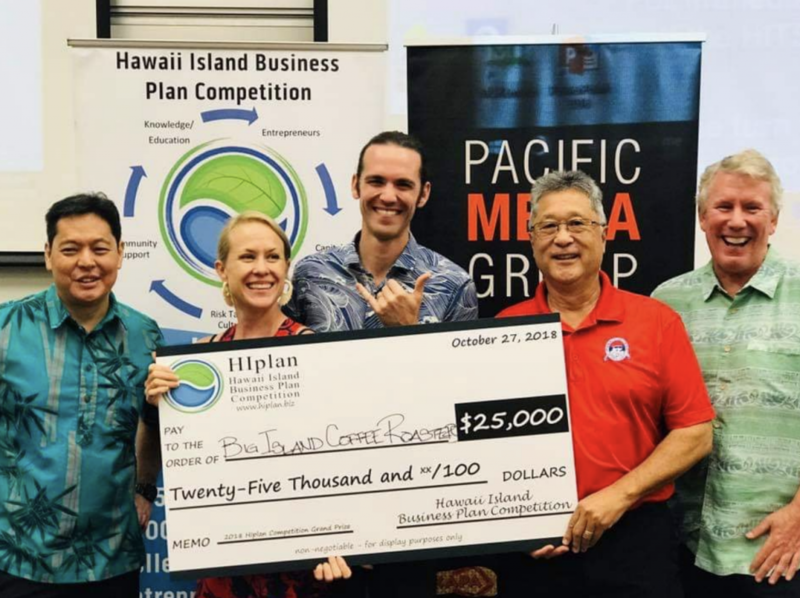 HIplan’s business plan competition was developed as a collaborative effort to help spur the growth of local businesses on island. 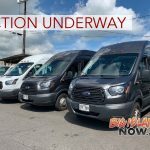 The competition encourages contestants to develop and/or polish their business plans with the goal of launching new or expanding existing businesses on Hawai‘i Island. 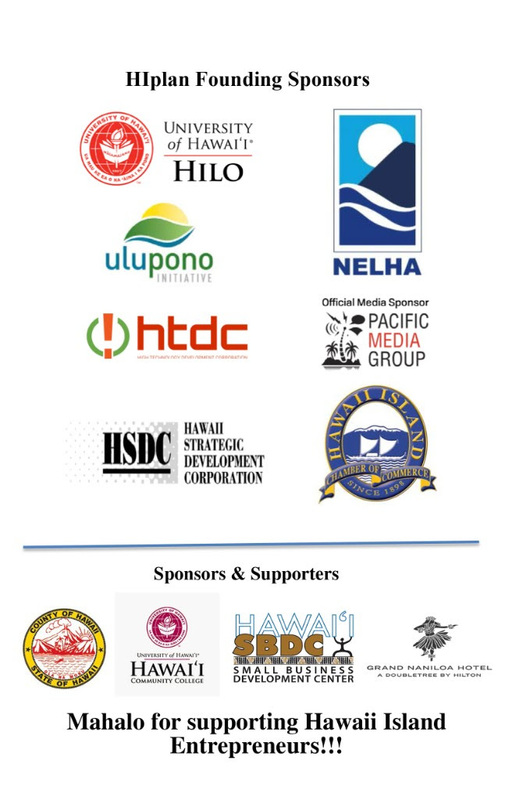 The University of Hawai‘i at Hilo, NELHA, Hawai‘i Island Chamber of Commerce, Hawai‘i Technology Development Center, Ulupono Initiative, Hawai‘i Strategic Development Corporation, Pacific Media Group, and the County of Hawai‘i are sponsors of HIplan. Thirty-one local businesses submitted business plans during round one of the competition in early September. Fifteen entrepreneurs advanced to the semi finals held Oct. 6 during which the semi-finalists presented 12-minute presentations to a panel of judges. After the semi-finals, eight businesses were selected as finalists and were judged on their written business plan, a two-minute elevator pitch, and a 12-minute presentation to a panel of judges. The semi-finals and finals had completely different sets of judges. 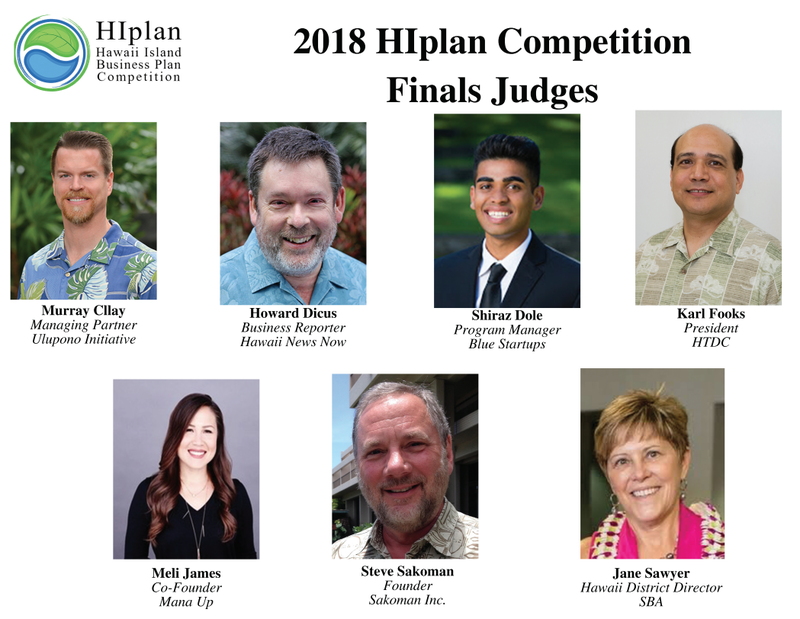 In addition to Sawyer and Fooks, the judges for the final round included Howard Dicus, business reporter, Hawai‘i News Now; Meli James, co-founder, Mana Up; Shiraz Dole, program manager, Blue Startups; Steve Sakoman, founder, Sakoman Inc.; and Murray Clay, managing partner, Ulupono Initiative. Greg Taketa, CPA, of Taketa, Iwata, Hara and Associates was responsible for tabulating the judges’ scores during each round of the competition. 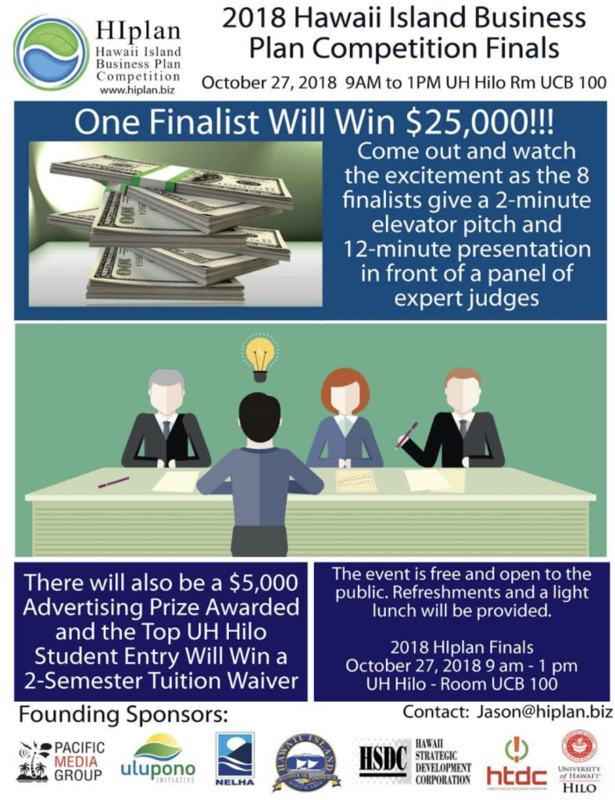 In addition to the business plan competition, HIplan holds monthly entrepreneur networking meet ups in East and West Hawai‘i, fostering a community of entrepreneurship. HIplan also partners with the Small Business Development Center, offering classes in Hilo and Kona on how to write a business plan and how to pitch a business to investors. 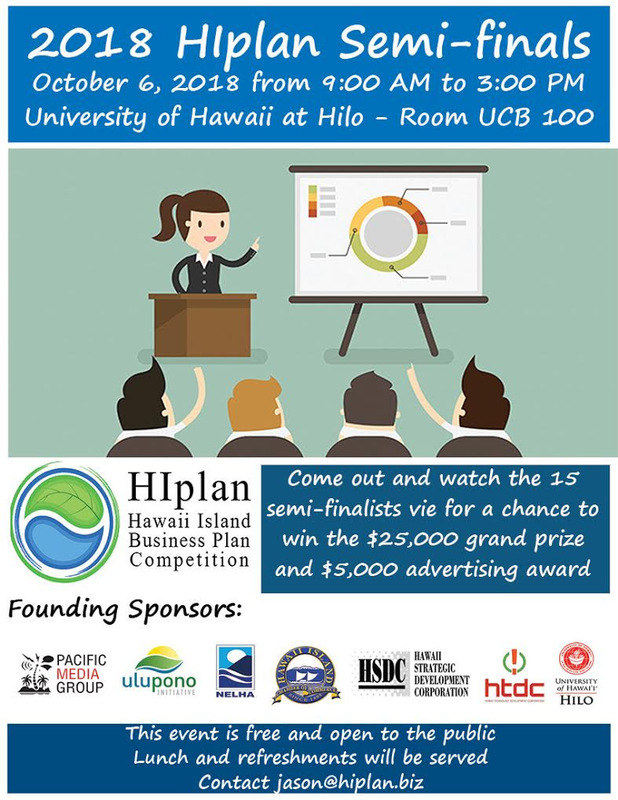 For more information on HIplan and the Hawai‘i Island Business Plan Competition, go online to or contact Jason Ueki, HIplan executive director at (808) 494-4031 or email Jason@HIplan.biz.